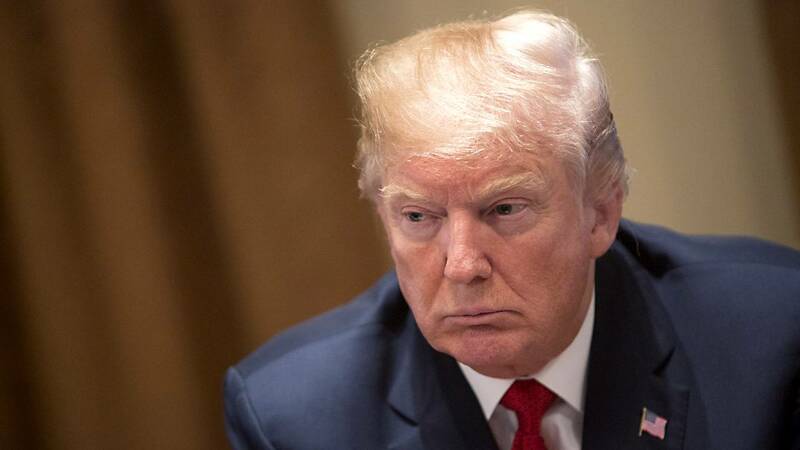 WASHINGTON (CNN) - President Donald Trump spoke to reporters Tuesday and tweeted at length about immigration and border security, saying the US "basically" has "no border." Here's what he said and what the reality is. Trump: "I just noticed that the caravan now, which is toward the middle of Mexico, coming up from Honduras, is breaking up very rapidly. That's because Mexico has very strong immigration laws, as we should have. ... I've just heard that the caravan coming up from Honduras is broken up, and Mexico did that. And they did it because, frankly, I said you really have to do it." Reality: There is an annual event organized by activists where migrants caravan through Mexico to the US, designed to highlight the dangerous journey that immigrants must undertake to escape violent and unstable conditions in their home countries. The migrants on the journey hope to make it to the US border, where they can make a claim that they qualify for asylum. Homeland Security Secretary Kirstjen Nielsen tweeted Tuesday that Mexican officials had told her the "caravan is dissipating" and that several hundred of the migrants had been sent back to their home countries, while others are being offered refugee status. "I thank the GOM (Government of Mexico) for their partnership on this and other security issues," she tweeted. Earlier Tuesday, Mexican Foreign Affairs Secretary Luis Videgaray Caso had tweeted the caravan was "dispersing" on its own and that Mexico's immigration policies would not be influenced by foreign threats. The Foreign Ministry told CNN that the caravan was not necessarily ending but that people were separating. In a statement Monday night, Mexico's Foreign Ministry had said that roughly 400 of the participants had been returned to their home countries. Organizers still estimated that over 1,000 participants were continuing on the journey. Trump: "We have very bad laws for our border and we are going to be doing some things, I spoke with (Defense Secretary) Gen. (James) Mattis, we're going to do some things militarily, until we can have a wall and proper security -- we're going to be guarding our border with the military. That's a big step." Reality: The administration has yet to articulate how this plan will work. Military resources being used for border security would not be entirely novel. For one, the US Army Corps of Engineers already handles border infrastructure and construction. The National Guard has also been sent to the border in the past, especially during surges of migration much higher than levels seen today. From 2006 to 2008, under President George W. Bush, 6,000 National Guard troops were deployed to southern border states under Operation Jump Start. The troops repaired and constructed border fencing and flew border protection agents by helicopter to intercept immigrants trying to enter illegally. In 2010, the Obama administration deployed National Guard troops to assist US Customs and Border Protection with surveillance and intelligence gathering while the agency worked to hire additional staff. Federal law explicitly prohibits the use of the military for law enforcement, however, without approval from Congress. Trump: "President Obama made changes that basically created no border, called 'catch and release.' You catch them. You register them. They go into our country. We can't throw them out. And in many cases, they shouldn't be here. ... They're supposed to come back to court. Almost nobody comes back to court." Reality: When deportable immigrants are arrested, some go into mandatory detention and some have to be released. Immigration officials have discretion on the rest. The US has the capacity to detain only roughly 40,000 immigrants at any given time, according to Immigration and Customs Enforcement and congressional appropriators, and in this administration and the last, many immigrants who are deemed not to be flight risks and not dangerous are released on their own recognizance or with monitoring technology. The Trump administration has expressed frustration in recent days with measures in the 2008 Trafficking Victims Protection Reauthorization Act and a 2015 court ruling on what's known as the Flores Settlement Agreement, a court case that goes back decades. Both created protections for children in immigration custody. Unaccompanied minors from non-neighboring countries must be turned over to the Department of Health and Human Services for resettlement within three days of arrest, as opposed to being held in lengthy detention, and children with their families also cannot be held in lengthy detention. To respond to that order, the Obama administration began releasing the families from detention, as opposed to releasing the children without their parents. Trump administration officials have referred to these measures as "loopholes" that criminals "exploit," though advocates and supporters say they are human rights and constitutional rights protections for vulnerable populations. The Trump administration has also been trying to tighten the rights of asylum seekers. Asylum is a policy under international law and US law that says noncitizens who can show they are likely to be persecuted in their home countries can legally stay in the US. If an immigrant tells an officer at the border that they fear persecution, they are given a "credible fear" test to determine if they may have a claim. Based on US Citizenship and Immigration Services data, the credible fear passage rate was nearly 80% in fiscal year 2017, which takes into account that these individuals are likely to be traumatized, unfamiliar with US law and have little English-language skills. Because of a massive backlog in the immigration courts, it can take years for those cases to work their way to completion, and many immigrants are given the ability to work and live in the US in the meantime, putting down roots. According to Justice Department data, 25% of asylum decisions were given in absentia in 2016, meaning those immigrants were not in court. That number in 2015 and 2016 was higher than years previous. Also according to the data, 43% of asylum petitions were eventually granted in 2016, a number that continued the downward trend of recent years. Trump: "Congress must immediately pass Border Legislation, use Nuclear Option if necessary, to stop the massive inflow of Drugs and People. Border Patrol Agents (and ICE) are GREAT, but the weak Dem laws don't allow them to do their job. Act now Congress, our country is being stolen." (Tweeted Monday). Reality: A bill that represented the White House's proposal to preserve the Deferred Action for Childhood Arrivals program, which Trump has ended, would not have passed even with the so-called nuclear option -- allowing legislation to pass with only a simple majority, instead of the 60 votes it now requires to advance bills. Trump's bill, which included hardline immigration measures, border security and drastically cutting legal and family-based migration, got only 39 votes, including those of three Democrats. A bipartisan proposal that picked up eight Republicans and nearly all Democrats would have passed in that scenario, getting 54 votes. That bill, which would have created a path to citizenship for DACA recipients, given Trump $25 billion for border security and put some restrictions on family-based immigration, failed to get enough support after the administration aggressively attacked it before the votes. In the House, a proposal from immigration hardliners that also meets much of Trump's wish list has languished. Despite Republican leadership whipping the bill, it lacks even enough Republican votes to pass the lower chamber, and would be dead on arrival in the Senate.